A distinguished Masorite who flourished in Tiberias in the first half of the tenth century. He was descended from a family of Masorites which can be traced back through six generations to Asher the Elder, who flourished in the last half of the eighth century. While merely the names of elder critics have been preserved, that of Aaron ben Moses is the first that appears in the full light of history, and with him the Masora may, in a certain sense, be considered as closed. He wrote a manuscript of the Old Testament and marked it with vowel-signs and accents. He spent many years of study in preparing this codex, and revised it several times. It became the standard for all later generations; and with a few exceptions (where it follows his contemporary rival, Ben Naphtali) the present Masoretic text is based on his work. The belief that this codex has been preserved in a synagogue at Aleppo is unfounded, and the opinion that Aaron ben Asher was a Karaite is untenable. He wrote short treatises on Masoretic and grammatical subjects, which occur in several manuscripts under various titles. The title "Diḳduḳe ha-Ṭe'amim" (Grammatical Rules of the Accents), under which S. Baer and H. L. Strack published them (Leipsic, 1879), was probably that selected by the author himself. He also compiled a list of eighty homonyms, "Shemonim Zugim," which was afterward incorporated in the "Masora Finalis," s.v. א, and in the "Oklah we-Oklah" ( ). 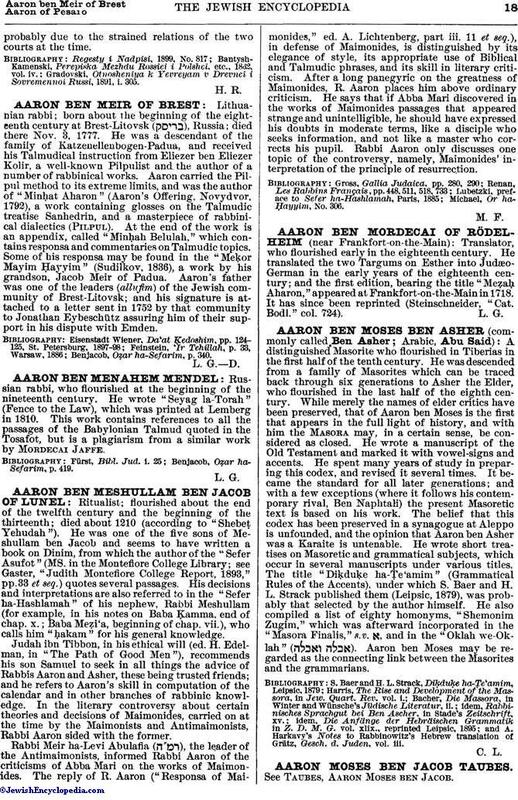 Aaron ben Moses may be regarded as the connecting link between the Masorites and the grammarians. and A. Harkavy's Notes to Rabbinowitz's Hebrew translation of Grätz, Gesch. d. Juden, vol. iii.